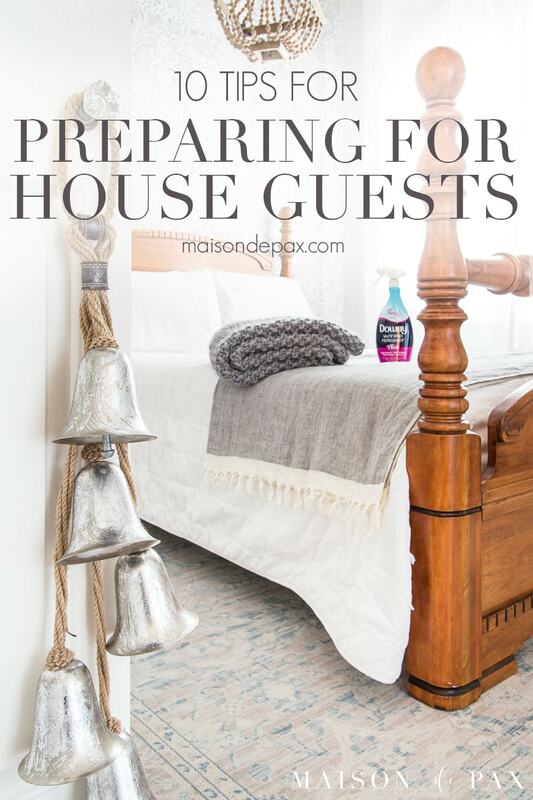 Preparing for house guests these holidays? 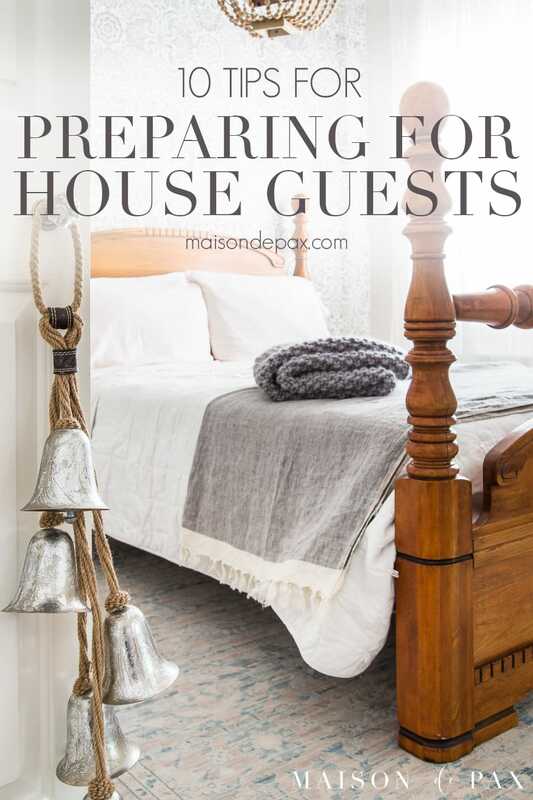 Hosting family or friends in your home is one of the joys of this season, but you won’t want to miss these quick and easy tips to save you time preparing your guest room for visitors! This post is sponsored by Downy Wrinkle Releaser Plus. As always, all content and opinions are my own. Like many people, we don’t live near much of our family, so the holidays always involve out-of-town visitors. Since the birth of our fourth child, though, we no longer have a dedicated guest room… which has made preparing for house guests a bit more complicated. We have opted for my four-year-old daughter to give up her room for guests and to bunk with her siblings, and in the process, I’ve discovered a few magic tricks to make the change over quick and easy! 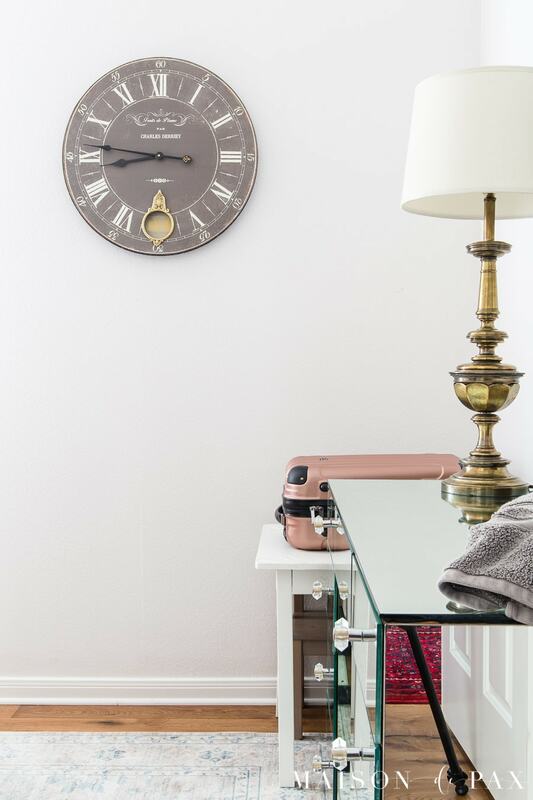 And these same tips can apply whether you are prepping your permanent guest room, converting an office to a guest room, or simply setting up a sofa bed. The joy of hosting others is in spending time together over good meals and great conversation, so don’t let the preparations of it all stress you out! 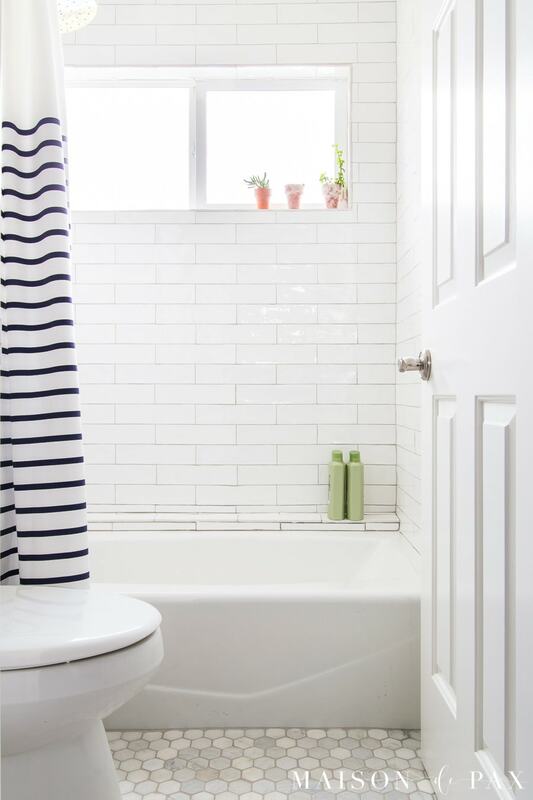 Check off these 10 things quickly and you’ll be ready to make your guests feel right at home. It can be a fold out rack, a shelf, or – in our case – a kid’s craft table pushed into the corner. Whatever it is, make sure there’s a spot for your visitor’s bag. Some guests like to unpack a little to feel more at home. Even if they prefer to live out of their suitcases, having a clear shelf to put their smaller bags, books, etc. is certainly helpful. It may not be glamorous in our home as our guests have to share their space with dress up clothes and puzzles galore… but at least they have one shelf to themselves. Gone are the days of little chocolate mints on each pillow (the toddler would definitely eat them and make a mess in the process) and themed gift baskets with local treats (I’m lucky if I remember what day guests are arriving and actually have any groceries in the house at all)… but a beautiful, inviting bed goes miles to making your guests feel welcome and pampered. My favorite sheets to use are 100% linen, though, which makes wrinkles a real challenge. Thankfully, Downy Wrinkle Releaser Plus makes smoothing out the wrinkles a snap! 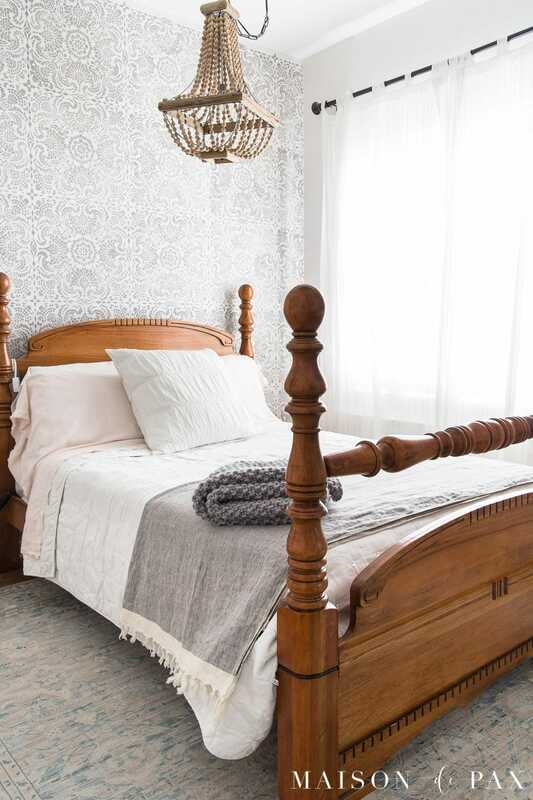 I give the pillow cases or hemmed edge a mist, smooth by hand, tug, and hang to fully dry over the side of the bed or sometimes the banister in the hallway. 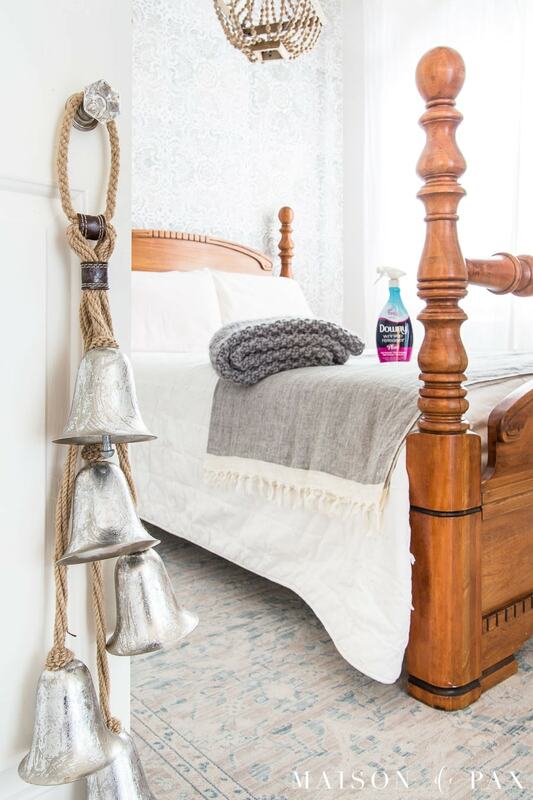 It only takes a moment, and Downy Wrinkle Releaser Plus leaves the linens smelling amazing. While they dry, I can check other things off my list. Sometimes I even spritz the curtains and throws while I’m at it… It leaves the room smelling fresh and feeling much more put together. Whether it’s a desktop fan or an actual sound machine, something to block out the noises of a strange house can work wonders for sleep. And a good night’s sleep is definitely the goal! 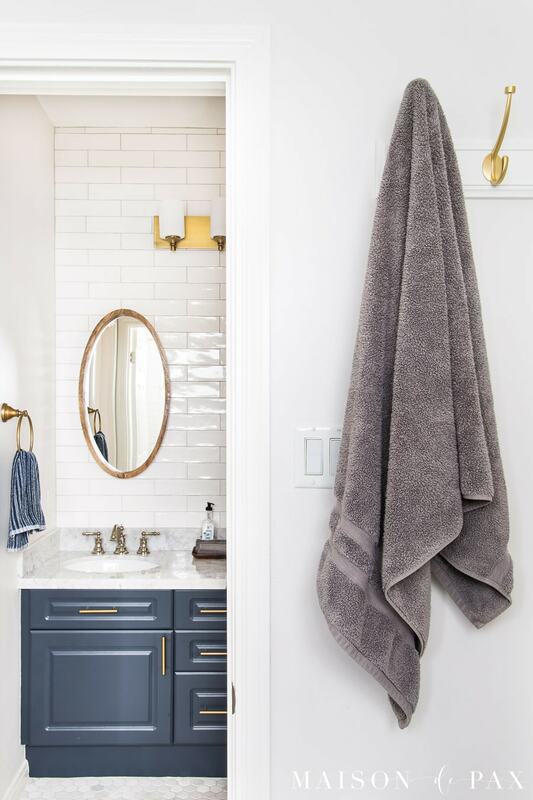 We always hang clean towels in the water closet and clean washcloths on the bathroom counter, but even if the guest is in the corner of your living room on a pull out sofa, make sure he or she can find those towels easily. Shampoo, conditioner, toothpaste, etc. Keep them on hand and accessible. 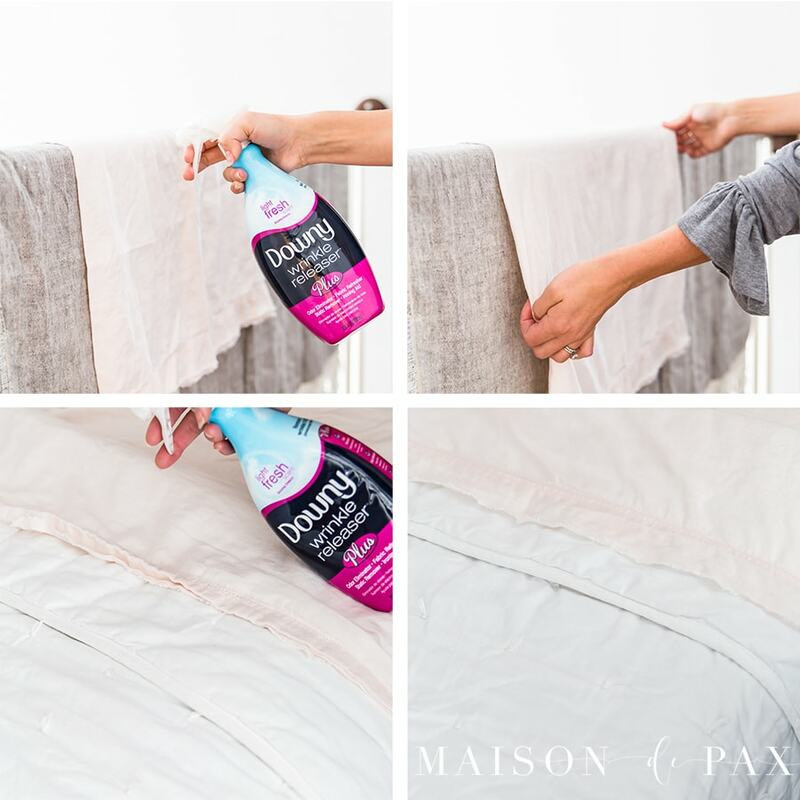 Once those unwrinkled sheets are dry, layer the bed with extra blankets. I like to use at least one lightweight and one heavyweight blanket in addition to the bedspread or quilt. It leaves options! These days, everyone needs a spot for device charging, and you want your guests to feel at ease. Having all the outlets hidden behind furniture is not going to help them feel like they have everything they need! They might not be beautiful, but be sure to have a power strip or extension cord by the nightstand and/or dresser to make plus easily accessible. It doesn’t have to be elaborate, but a little wreath, a set of bells, a pumpkin candle, or some fresh flowers can go a long way towards helping a space feel appropriately celebratory for whatever occasion has brought your guests to your home. 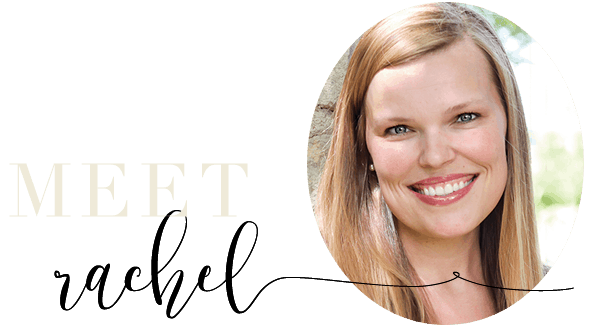 Whether it’s my own parents (who come frequently), or an international visitor coming for the first time, I’ve found that these 10 quick steps help me feel prepared and help them feel at home… which is definitely the goal. What’s your favorite way to make guests feel welcome? Be sure to grab yourself a coupon for Downy Wrinkle Releaser Plus here to help save you money and time getting your home ready for visitors! And don’t forget to pin these ideas for later. Hey friend! Great post! Where did you get those bells? So cute! I like to add a small floral arrangement and a basket or tray with a bottled water, packaged snack, and a little seasonal decorative item….will now add a little note with our Wi-Fi password. Thanks for the tip. Happy Thanksgiving! Where did you get 5hose gorgeous bells? Great list and i believe you have covered everything, have a Happy Thanksgiving. Glad it was helpful! It can be so hard to sleep outside of our own bed, right? 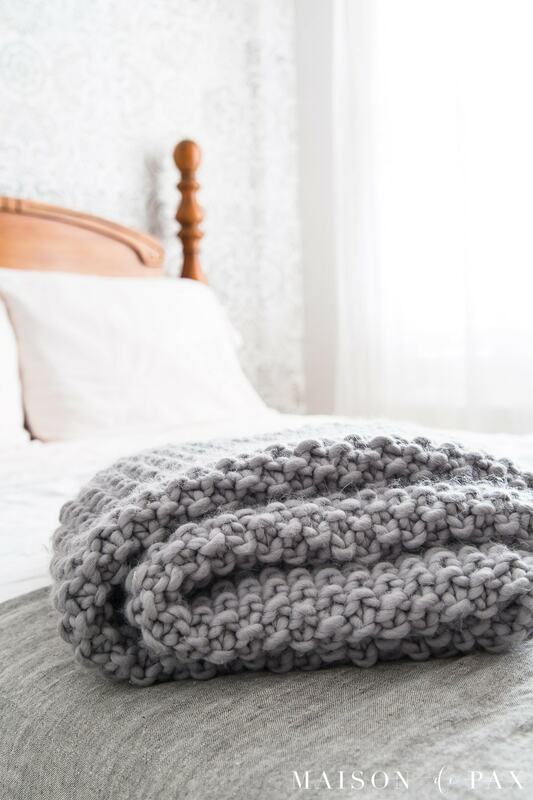 Where did you get the chunky grey knit blanket? It looks so cozy. Great ideas, simple, practical and inexpensive … Love it! I asked you the other day where you got those gorgeous bells. I was in hobby lobby tonight and telling my daughter about you and the bells. Just as I said it, I turned the corner and there were the bells on an end cap! Only one set! I grabbed it as fast as I could! Lol. I told my daughter it was meant to be!! Love those bells……..
That does sound meant to be, Janie! Thanks so much for coming back and sharing that!